With winter just around the corner...at least in most states...I thought pot roast would be a good thing to talk about. 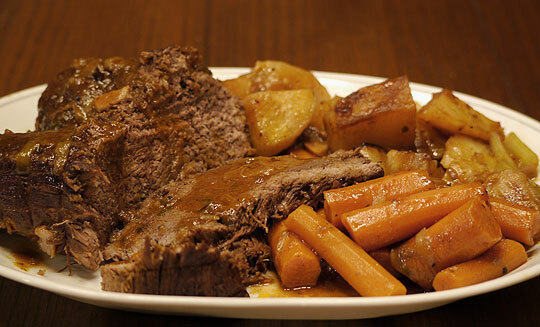 A braised beef dish typically made from inexpensive cuts of meat; pot roast goes a long way when serving your family. Leftovers can be used to make sandwiches or turned into a hearty sauce for pasta. Traditional vegetables like carrots, onions and potatoes are usually slow cooked along with the meat. I switched it up a bit and added leeks, celery and turnips. I bought all the ingredients for both meals below at Whole Foods Market. The butcher at my local Whole Foods was very knowledgeable and helped me pick the right cut of meat for this recipe. In hopes that you will check out your local Whole Foods I have partnered with them to give away a $25 gift card to one lucky blog reader. **Contest Rules** All you have to do is leave a comment on this post; letting me know what your favorite thing about Whole Foods Market is. For an additional entree like Whole Foods Market Scottsdale on Facebook and leave another comment here letting me know you did. Contest ends at midnight on 11/7. Winner will be announced on the blog. Preheat oven to 400. Place potatoes and turnips in a large roasting pan and toss with 3 tablespoons oil. Sprinkle with 2 teaspoons salt and 1/4 tsp pepper. Roast until golden brown and crisp. About 30-40 minutes. Remove from oven and set aside. Reduce temperature to 350. Combine flour, 1 tsp salt, paprika and allspice in a small bowl. Place beef on a work surface and pat dry with paper towels. Sprinkle flour mixture over meat and pat to coat well. Heat remaining 2 tbsp of oil in a large Dutch oven over medium heat until hot but not smoking. Sear meat on all sides until golden brown, about 2 minutes per side. Transfer to plate and set aside. Reduce heat to medium low. Add leeks and garlic. Cook stirring occasionally until leeks are just softened about 3 mins. Add wine and deglaze pan by scraping any brown bits with a wooden spoon. Bring to a boil and cook until most of the wine has evaporated. Add stock, paste, herbs and roast. Cover and place in oven for 30 minutes. Turn and cook another 30 minutes. Add carrots and celery cook for 1 1/2 hours; turning meat every 30 minutes. Add potatoes and turnips. Return to oven, uncovered, and 30 minutes more. Season with salt and pepper. Transfer meat to cutting board. Let sit 5 minutes to rest. Slice meat on the bias and serve with vegetables and sauce. Heat oil in a large skillet over medium heat. Add shallot and garlic and cook until softened, about 3 mins. Add wine and cook until most of the liquid has evaporated. Add copped meat and vegetables, stock, tomatoes and thyme. Bring to a boil and reduce to a simmer. Cover and cook 30 minutes until flavors blend and sauce thickens. Stir in salt and pepper. Serve over cooked pasta. My favorite thing about Whole Foods is their salad bar! It's so convenient and yummy! I love the produce at Whole Foods! Oh wow, one of my fav meals!! I love Whole Foods- when I want a day to unwind and treat myself, I go there- can you tell I'm a foodie? Lol I really love the array of vegetables there. I always leave loaded up and inspired! I also went and "liked" their Facebook page! I like Whole Foods because is healthly with no saturated fats. I love that pot roast recipe, it will be on my list for this weeks menu. I love my local Whole Foods Market. I like browsing throughout the store. The butcher at the meat counter is personable---I feel comfortable asking for special cuts. When I don't feel up to cooking, I know I will find something I like in their hot and cold foods section. Okay, on to Whole Foods... I really appreciate their knowledgeable staff! They actually take time to listen to your needs, and then if they don't know the answer, they'll take you to someone who does. That, my friend, is amazing customer service! I just love how the meats and such look and taste better than your every day grocery store! I love the bakery at whole foods and their selection of various honeys, one of my favorite things! I like Whole Foods Market Scottsdale on Facebook. I love that I can bring my own containers into their store and leave with no packaging (if I stick to their bulk, produce, and butcher sections). I love this giveaway b/c I love to say how I feel about Whole Foods. One opened up near me a few years ago, and I've always been into healthy eating and choices. But Whole Foods has blown me away! I can't praise them enough. What I like the most is I've learned a lot, I'm at the store often, exploring new foods, adventuring down the aisle, going to their classes, being part of the community with all kinds of activities and caring. I like reading their magazine, blog and website. I've become more conscious about what is ecologically good choices for seafood, etc. And the cheese department - I love Cathy Strange, the cheeses alone make WF outstanding. I could continue.... but all I have to say is, the best thing a person can do is start going to WF and trying new things. I find great prices at WF, shop their sales and many things actually cheaper than the grocery stores around, and the quality and guarantees are best. It has made our community of West Hartford even better, it is the most outstanding store in the area, and does a great clip of biz. But it is much more than just produce and products- they are trying to educate ppl about caring for their families and the environment with healthy choices. Both of you spins on pot roast look amazing. I love the bulk bins at Whole Foods. I love that they have products you can't find anywhere else! It is always fun to go in there. I like them via FB as Alaine Elise. I love turnips with my roasts, they seem lighter than potatoes; and by mixing potatoes,turnips,carrots,and celery,it males a lovely leftover mashed blend. My favorite thing about Whole Foods is that when I take non-believers shopping with me there I can show them the variety and diversity and value. Like another post before me stated,for the high quality,healthy food the price is right and often much lower than conventional stores and the conventional options with lesser nutritional value. I Liked Whole Food Market Scottsdale On Facebook ! Hello, I have also "liked" the Scottsdale Whole Foods!!! I love their blog. It's a seemingly endless resource for recipes, news, giveaways, interesting articles about current issues, products and producers, cooking technique tutorials, etc. I learn so much from them and also from the commenters. They always offer tips and additions to recipes that are totally surprising and inspiring. Cheers! I love that whole foods has such a wide variety of products as well as their own house brand. Hi there! Lovely blog. My favorite thing about Whole Foods is you can trust what they sell. They are constantly updating, expanding and finding new ways to link us all to healthy food and empower our choices! I cannot say enough about them. 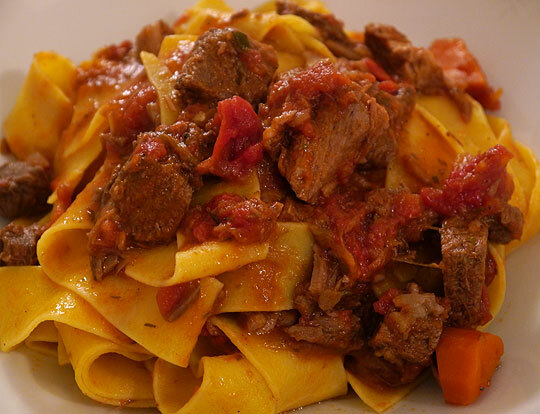 That ragu looks great! I like the meat and seafood counters at Whole Foods the best. Grass-fed beef is the way to go. I love Whole Foods because it is a food adventure! I'd rather chart the isles at WF than be on an African safari. So much to enjoy, much to learn and experiment with new foods. Also, I love their website and information on being a conscious consumer, so we can be smart and caring consumers. LOVE, LOVE, LOVE!!! My favorite thing about Whole Foods is a) proximity. I live 4 blocks from one in San Diego, CA! and b) A ton of healthy food options. When eating healthy is a way of life, there is no better store in America than Whole Foods. Not to mention the people that work there are super nice and helpful! Ive always been a health freak and whole foods has allowed me to feel accepted and go all out! Being in there makes me so happy and the workers are so helpful. I love the skincare aisle! The skin is the largest organ in the body, i don't want to absorb any bad chemicals! Looks great! The closest Whole Foods is about half and hour away so I don't get there often, but I travel there for my King Arthur Cake Flour. They're the only ones that carry it around here! Can't wait to try this roast! I love that Whole Foods has soy free items. Plus they take coupons! Also Liked them too! I love the 365 brand at Whole Foods! I also love their wide variety of organic fruits and veggies as well. that rump roast looks sooooooo good!! I have to try it. So far, my fav thing are their shrimp. I keep trying new things, and my fav's keep changing! Hard to pick one thing. OK, yesterday, I enjoyed the Thanksgiving tastings at my local Whole Foods, a whole plateful of yummy Thanksgiving foods you can buy there. I think I need to say my favorite thing now is the sense of community and spirit that engenders healthy living and the vibrancy that Whole Foods has brought to our area. It was sort of staid and even a little grumpy before, but our town has been totally transformed thanks to Whole Foods! The Thanksgiving tastings was just all these customers and staff feeling like good friends and family with everyone enjoying their treat. I could tell the little boy next to me really enjoyed his dinner and snuck back for seconds!!! and who knows - maybe for thirds! !